Find out how science shapes our world, from the importance of bacteria to discoveries in the solar system and beyond, at the University of Southampton’s award-wining annual Science and Engineering Festival. 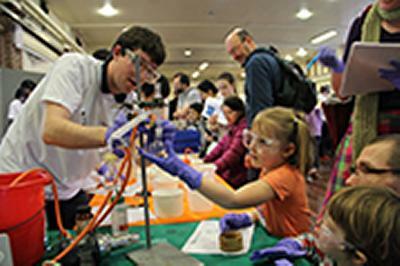 The festival, which is part of British Science Week, includes two free public open days – Science and Engineering Day on Saturday 14 March and Ocean and Earth Day on Saturday 25 April. Science and Engineering Day takes place at the Highfield Campus from 10.30am to 4.30pm (last admission 4pm) with fascinating exhibitions, interactive displays, talks and shows. This stimulating and fun day is free and there will be lots to see and get involved in for all ages including: wearable technologies; the health of your home; landslides; the secrets of animal bones; virtual musical instruments; stem cells; knee replacements; memory loss; immune cells; and much more. As 2015 is the International Year of Light, explore the fibre-drawing towers and clean rooms, which produce the optical fibres that power the Internet and power global communication networks. Visitors will be able to enjoy over 80 shows, tours and hands-on activities, including Festival favourites such as the Southampton Astrodome, the Light Express Laser Show, Railway Research laboratory and Ian B Dunne’s ‘Science Magic...Magic Science’. 2015 is also the centenary of Einstein's Theory of General Relativity, so there will be specific mathematics activities related to this, including a lecture on the Science of Stephen Hawking. Ocean and Earth Day is being held in collaboration with the National Oceanography Centre Southampton, based at Dock Gate 4 from 10.30am to 4pm (last admission 3.30pm). The oceans are the key to the long-term health of our beautiful blue planet. They continue to surprise and amaze as you explore this mysterious realm from the coast to the deep ocean. Visitors can see examples of the technology needed to explore the deepest oceans - have a go at driving a mini Remotely Operated Vehicle (ROV) and see how 3D printing and laser cutting is used to create and develop parts for these specialist vehicles. There will also be fossil plaster cast making, panning for gold and marine animals from the research aquarium that you’ll be surprised to find come from UK waters. Professor William Powrie, Dean of Engineering and the Environment, comments: “The University of Southampton undertakes world-leading science and engineering research and teaching, which contribute to understanding in a wide range of areas, including global communications, sustainable energy, medicine and more. One of the aims of the Science and Engineering Festival is to inspire interest in these fascinating subjects and demonstrate just how exciting they can be.